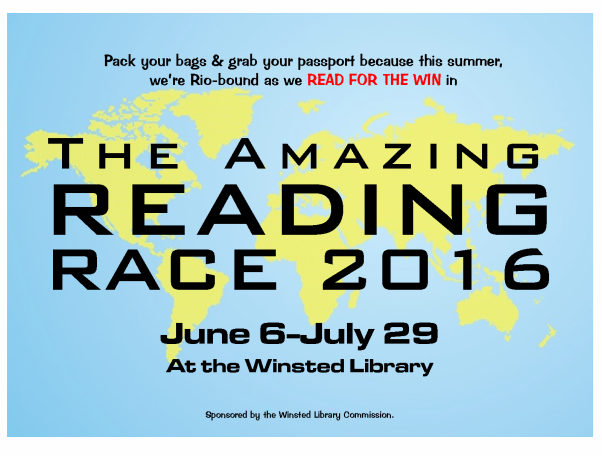 Winsted Public Library | Are You Ready for this Summer’s AMAZING READING RACE? Are You Ready for this Summer’s AMAZING READING RACE? This summer we’re Reading For the Win as we do a whirlwind tour of the world on our way to Rio for the Summer Olympic games! From weekly Minute to Win It Challenges, to Games in the Park, to SUPER-Sized Games in the Library, to a whole new series of Library After Hours events, there’s something for everyone to enjoy at the Winsted Library this summer! 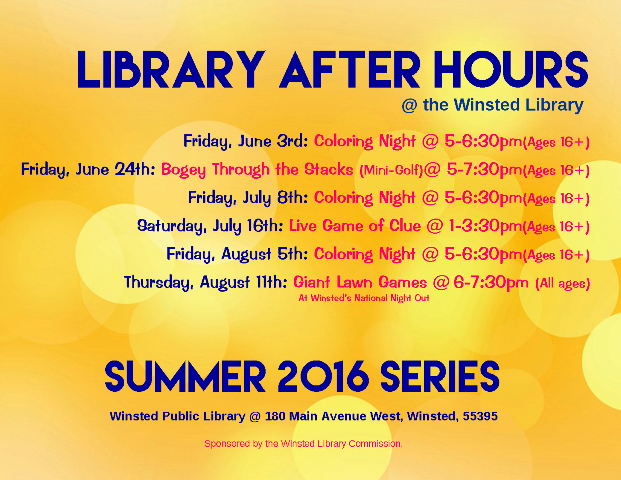 For our Summer 2016 Library After Hours Series, we’re all about playing and having fun! Are you feeling stressed out? Come color with us on one or all of our Coloring Nights this summer! You can bring your own projects and supplies, or use some of ours. It’s a great way to unwind and relax after a hectic week. Or maybe you’d like to come Bogey Through the Stacks with us on June 24th, as we turn the Winsted Library into a mini-golf course–you can bring your own putter, or borrow one of ours. Tee-times will be assigned at registration, so be sure to book yours today! Was it Colonel Mustard in the Library with the Candlestick? Or was it Miss Peacock in the Kitchen with the Rope? Come play a life-sized version of the popular board game Clue with us on Saturday, July 16th and try to figure out whodunit! And to end the Summer, come join us during Winsted’s National Night Out for some Giant-Sized Lawn Games! We’ll have Yard Yahtzee, Giant Jenga, and other great games to play.